The Financial Times and other international media reported Luis Videgaray will step down as Mexico’s finance minister, citing local media reports on Wednesday Sept. 7. Videgaray, one of President Enrique Peña Nieto’s closest allies and the architect of his structural reform programme, has been in the firing line after last week’s disastrous meeting between the president and Republican US candidate Donald Trump, which was reportedly his idea and which he has defended to the hilt, writes Jude Webber. Videgaray is expected to be replaced by José Antonio Meade, social development secretary, who has held the post under former President Felipe Calderón and is considered a safe pair of hands. Videgaray’s spokesman could not immediately be reached but she told the Radio Fórmula radio station that the minister was leaving his post, according to tweets from Ciro Gómez Leyva, the radio show’s host. 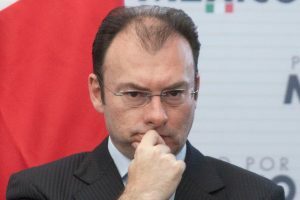 Videgaray, dubbed the “Viceroy” for his power behind the throne, is little loved by corporate Mexico. The government is due to present an austere 2017 budget on Thursday as concern mounts about sluggish growth and rising debt. Mexico shares fluctuated on the news, with the iShares MSCI Mexico exchange-traded fund falling as much as 1.1 per cent before paring its losses to 0.7 per cent.